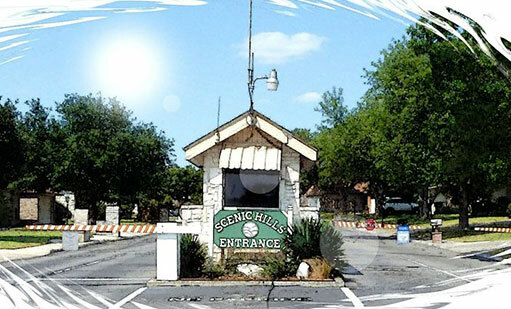 Scenic Hills is a beautiful gated community designed to provide a small town lifestyle of leisure and friendliness for adults 55 and over. 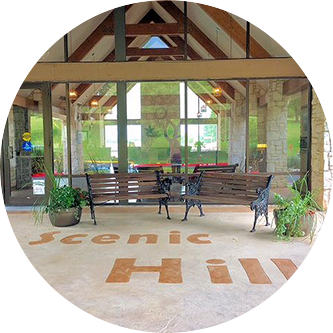 We sincerely appreciate your interest in the Scenic Hills community! Would you like a guided tour of our community? Many of our residents volunteer to serve as guides to provide tours of Scenic Hills from 10:00 a.m. until one hour prior to darkness each day of the week. The tour will include driving through the entire community with a special emphasis on the homes for sale, a walkthrough of the Lodge and, if interested, a drive-by of the RV Storage Area. To avail yourself of this tour, just stop by the Guard House and ask for a tour. At that point you will be provided a Scenic Hills brochure and a listing of homes and lots that are currently on the real estate market. In order to see a specific home or homes, it will be necessary to contact the listing agent who will make the necessary arrangements for the home to be shown. As our tour guides are all volunteers, there may be rare instances wherein it is difficult to locate an available volunteer guide to conduct the tour and, if that circumstance arises, we ask for your patience and understanding. Please know that our Staff and Volunteers will make every effort to assure your visit is as pleasant and productive as possible. © 2018, Scenic Hills Community Association. All Rights Reserved.